Pursuant to the 2015 Act, Treasury finds that no major trading partner of the United States met all three criteria in the current reporting period. Five major trading partners of the United States, however, met two of the three criteria for enhanced analysis in this Report. Additionally, one major trading partner, China, constitutes a disproportionate share of the overall U.S. trade deficit. These six economies – China, Japan, Korea, India, Germany, and Switzerland – constitute Treasury’s Monitoring List. Japan, Germany, and Korea have met two of the three criteria in every Report since the April 2016 Report (the initial Report based on the 2015 Act), having material current account surpluses combined with significant bilateral trade surpluses with the United States. Switzerland has met two of the three criteria in every Report since the October 2016 Report, having a material current account surplus and having engaged in persistent, one-sided intervention in foreign exchange markets. China has met one of the three criteria in every Report since the October 2016 Report, having a significant bilateral trade surplus with the United States, with this surplus accounting for a disproportionate share of the overall U.S. trade deficit. India met two of the three criteria for the first time in this Report, having a significant bilateral surplus with the United States and having engaged in persistent, one-sided intervention in foreign exchange markets. Treasury will closely monitor and assess the economic trends and foreign exchange policies of each of these economies. Regarding the 2015 Act, while no economy met all three of the criteria for the current reporting period, Treasury remains deeply concerned by the significant and persistent trade imbalances in the global economy. The global adjustment process has not worked effectively to promote a symmetric adjustment toward smaller imbalances in a manner that sustains – rather than inhibits – global growth. A times series on Chinese FX intervention is displayed below, demonstrating why currency manipulation is hard to identify by the simplest criterion. Source: US Treasury, Macroeconomic and Foreign Exchange Policies of Major Trading Partners of the United States, April 2018. The table below summarizes how countries stack up along the three criteria used by Treasury. For an assessment using the Penn effect as well as a macroeconomic balance approach from a year ago, see this post. This entry was posted on April 16, 2018 by Menzie Chinn. I guess I’m going to keep my crown as “King of Questions With Obvious Answers” by asking Menzie: You obviously still give a lot of credence to this US Treasury publication even though Treasury is now inhabited by many Trump cadres now?? You do avoid the “foolish consistency”! Lock step with Trump on Saudi funded terrorists’ (the army of Islam [peace]) with their ‘white hat’ duper’s false flag but Trump is delusional on trade issues. I suggest a consistency with Trump is just right! Alex?? Alex Jones?? Is that you?? Your wife called. She says thanks for being a nutjob so she could get possession of the kids. I was hoping this might be the case, although you can tell from my comment that I did not know. Was kind of assuming Sensitive Stevie Mnuchin had got some of his own cronies into Treasury. Extremely happy to hear it. Certainly psychologically (for those who like objective facts) reassuring news on many levels. I’m guessing you meant to type “excluded” on that last part, but we got what you meant. The last point you made is an important part. We may barely respect Kevin Hassett right?? (Although I suspect you actually respect him more than I do). But we know Hassett is going to distort the CEA report (i.e. cherry pick data). Moses Herzog: Yes, you are right – I meant “excluded”. Have edited. Is it possible that some of the Treasury staff were burrowed within the agency during the Obama years(prior to GWB leaving office)? Once Trump takes office, they start putting regs to reverse Obama policies at least I’ve heard the Washington Post have reported that. “The world’s second largest economy grew 6.8% in the first quarter of the year from the same period a year earlier, according to government data published Tuesday. Analysts and even Chinese government officials have for years cast doubt on the accuracy of the country’s official economic data. Some economists use a range of other information sources — like electricity output and freight shipments — to generate independent estimates of how the Chinese economy is performing. Those gauges often don’t tally with the government numbers. Just because PeakyBoo lies 24/7 does not mean that this Chinese statistics is dishonest. BTW – try to be at least be honest and note this kid is your guru! Peaky’s own source does not claim China lies about their data. Whether they get everything right is one thing. But notice how Peaky provides no links, decides not to tell us the true name of his source, and when one reads the actual document, it portrays a different message from the cherry picked quote Peaky gave us. Please do not defend his blatant dishonesty here. There are enough issues with China’s economy – no need to invent fake news. Fair enough—PeakIgnorance doesn’t credit his source of info very well. But I think Evans Pritchard writes regularly in “The Telegraph”. If it’s a recent column it shouldn’t be too hard to find. As far as I can tell he doesn’t have any real economics credentials and is quoted by morons like Yves Smith all the time. Take it for what it is. I looked at 3 Pritchard bios—none of them say he has a business degree, or even a business minor. Which basically means he writes prolifically and knows what column titles get people to click on sh*t. Happy to be corrected if anyone knows different. Pritchard is useful to publications that need to upchuck large amounts of daily reading material. Does the man trade large amounts of his own money?? I doubt it. Is Pritchard “the devil” or a charlatan?? No. Neither is he a guy with any deeper insight than anyone who bothers to read. But I 5think Evans Pritchard writes regularly in “The Telegraph”. Ambrose the father does. Julian is his son. Yes Peaky mislead us on why wrote that line as well as cherry picked it out of context. That’s my point – Peaky is a liar. Maybe it was actually my mistake, it does say “Julian” in PeakIgnorance’s poorly typed link. Unless it’s something that just extremely annoys the hell out of me, or someone is attacking Menzie in an unfair way (I know you’re not going to believe this based on the amount of my comments), but I try to filter myself and let it go. I figure regular readers and people with basic economics knowledge aren’t going to give PeakIgnorance’s comments any weight anyway. So by responding to him I feel all I am doing is magnifying it. It’s kind of like correcting Alex Jones or Republican radio hosts—-if you’re going to correct every lie they tell it becomes a full-time job. Hi. Is it feasible for the US to reduce/eliminate its trade deficit by selling dollars in the FX market? Just wondering! KC: Doubt it, if intervention is sterilized. In conditions where capital mobility is high, it would have to do massively large intervention to drive down the value of the dollar sufficiently to eliminate the trade deficit. I think only a combination of fiscal (tight) and monetary (looser) policy combined with reining in credit (by tighter regulations) could do the trick. I would argue (over a longer arch of time than you and KC are probably thinking of) that fiscal policy wouldn’t even have to be “that” tight, if Republicans ever decided they wanted to tax Warren Buffett as high a rate as they do the janitor at Geico’s corporate headquarters. 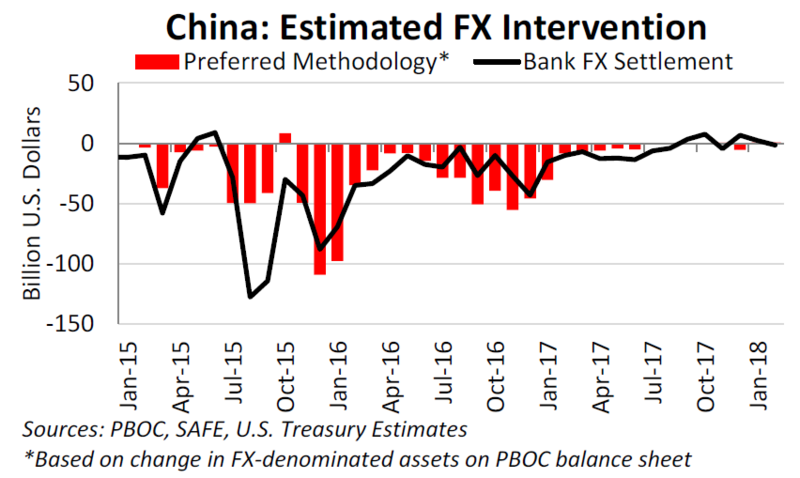 Let’s see – China’s currency has devalued since Trump became President. Comey is right – Trump lies about everything! Well, pgl, there are bad people on both sides, believe me. Devalued currency is fake news. The tax cut, the largest in history, will make our dollar stronger and will enable us to sustain growth at rates never before seen here. Growth will be even higher when we get our porous border under control and stop the flow of illegal dollars to Mexico. Believe me, that’s why border wall–the largest and most impenetrable ever to be built–is a necessity. You can count on Mexico paying for the wall in dollars–strong ones too–not pesos. We’ve already seen America great again, and it will be even greater, believe me. Trump is whining about other currencies allegedly depreciating with respect to the US$ as the FED raises interest rates? My Lord – could he hire at least one competent economist? Tight money is supposed to appreciate one’s currency. So it is the US that is doing the manipulation game. Funny thing – it ain’t working. Of course the 3 stooges – Kudlow, Navarro, and Ross – can’t be bothered to give their boss the facts. I’m curious as to why Trump included Russia in his tweet when it’s not one of the six countries mentioned. I thought devaluing Russia’s currency was a strategic objective. And that line about the rising interest rates is a real head scratcher as well. Didn’t he expect his deficits to lead to some combination of higher interest rates and an appreciated the dollar? And how could a euro country ever get three strikes if one of the strikes is supposed to include FX intervention? This whole thing seems screwy. Maybe but they are failing at this too! It seemed like to me the main thing that has taken the wind out of Russia’s sails was the drop in the price of oil, roughly mid-June of 2014. That seemed to be almost accidental due to fracking and the progress in clean energy sources. I’m only an amateur observer, but I dare say I read more than most. I don’t think the sanctions (although I am pro-sanctions and glad they are doing them) have made a lot of difference. Of course when you have a US President who works overtime to contradict his own Ambassador to the UN along with contradicting a large segment of his own international policy advisers, that doesn’t help. As Menzie is obviously way more knowledgable about currency and FX than I am—but the view from my bird perch says this women is very sharp-minded and has pretty much managed to keep Russia’s ruble as stable as can be expected under the sanctions etc. How long can she perform near miracles keeping the ruble steady with smoke and mirrors?? My gut tells me longer than people think she can. Seriously – this is how they estimate the world’s largest economy’s output? Now what specifically do they have an issue with how the official estimates are calculated? “One of the big issues with the economic data in China is the reliability of the price data. We are not necessarily that confident in the way in which they’ve deflated the data from nominal to real, and that is one of the biggest issues that we have with the official GDP figures as well. “One of the interesting things about our index is that it used to track the official figures quite closely, but it was really starting from 2012 that our measure is showing slower growth than official figures.” As it happens, 2012 was the first time there was any real risk China would fall short of the official target. Evans-Pritchard doubts the figures are made up. “We do think that the statistics bureau do the best job they can to collect accurate figures at least at the nominal level, but there are quite a few assumptions that you need to make [around the deflator],” he says. OK – China does report a very low inflation rate which may be tainted by political pressure. Of course the right wing politicians that PeakyBoo works for would never question our reporting of inflation figures – would they? Do any of us here know who “PeakyBoo works for”?? I seriously doubt anyone who makes that many typos (nevermind basic economic orthodoxy) is gainfully employed by anyone in the media or PR industry. Typos -eh. Maybe Peaky is the one that does all those tweets for Trump. peaky is no longer employed. he was fired during the financial crisis, and lives the life of leisure as a failed banker. he was born in another country to wealthy parents, who paid for his junior phd (ie masters degree) in the usa because he could not enter the actual phd program. since his firing from the financial business, he has spent his time trolling economics blogs with semi-literate commentary which has increasingly taken on the aura of unpaid russian trolls for the trump. he longs for the days when he still had the silver spoon in his mouth. The only significant sector in terms of U.S. exports to Russia seems to be aircraft. Maybe Team Trump can buy a lot of shares of Boeing and then have American taxpayers subsidize aircraft exports to Russia. That way they can profit and Putin can too! I’ll admit I do not follow the Russian currency that closely but this does not look like a ruble devaluation to me. Is Trump just lying again or is his economic advisers really this incredibly stupid? Of course Kudlow’s forecasting recording excels – right?! What would you expect from someone who doesn’t even have an undergraduate degree in economics never mind any econometrics training. Or maybe it’s because he uses Excel to forecast! FRED also provides interest rates on 20-year corporate bonds with rating AAA or BBB. These rates are not higher either. Maybe Kudlow should either give Trump more accurate information or take away that stupid Twitter. Mnuchin was asked about this on CNBC’s The Squawk Box! The honest answer would have been “I work for a moron”. But then honesty gets you fired in this White House! country will run a current account surplus. So the trade deficit is being driven by the republican tax cuts that were used to deliberately create a budget deficit, otherwise known as starve the beast. Starve the beast is the major factor destroying US manufacturing. Why cann’t we get this message across to the public? Haven’t any business reporters ever taken a basic course in international economics? Come on, Peak trader explain to all of us why this is wrong. Spencer, in the late ‘90s, we had the peace dividend, welfare to workfare, the Clinton-Gore reinvention of government to increase efficiency, etc.. The GOP Congress wanted a balanced budget amendment. Moreover, the Baby-Boomers reached their peak productive years in the late ‘90s. We had strong economic growth – actual output exceeded potential output – which raised tax revenue. Living standards rose faster from greater consumption and we were beyond full employment. Consequently, private saving likely fell, and public saving and imports rose. Economic conditions are not the same today. We need a massive overhaul of entitlement spending, which is crowding out other government spending and GDP growth. It’s a spending problem – tax cuts were needed to refund consumption and spur investment (also, with capital inflows). Although, income taxes have become more progressive, And, other taxes are too high, e.g. an Illinois company went out of business, because property taxes were over $100,000 a year compared to $20,000 next door in Indiana. The trade imbalance coincided with high manufacturing productivity and high-end manufacturing growth. And, what starved the beast in 2000 was taxes, including capital gains taxes and the Alternative Minimum Tax, weren’t cut. Entitlements deform again? Yes – cut granny off so we can have more bombs paid for by tax cuts for the rich. Standard right wing rant. At least there were not that many typos this time! It is not the revenues the government receives, but the spending it makes that causes the budget to balance or not. The appropriators can not seem to cut their spendthrift ways. And what difference there is to excess spending, dems seem to spend in excess more, but repubs try hard to match them. Starve the beast is old time strategy, attempted and failed in the 80’s. Since that time, which either party is out of power uses balance the budget slogan in the campaign. Does not matter which party. And when in power, (doesn’t matter which one) that party is happy to spend in excess. Look to Congress for the problem, it is about their last Constitution authority they jealously guard. Please look at the Line 23 of NIPA Table 1.10 and then try and tell us that Democrats are the party of big spenders. Then look at Line 25 and tell us that non-defense spending is out of control. Then look at column “I” of Table 1.2 of the OMB Historical Tables. Notice that Social Security is running a surplus and is reducing the current year deficit. And it’s been that way for years…not, decades. Look at all those data and try and tell us with a straight face that the problem is spending and not revenues. And while you’re looking at OMB Table 1.2, focus your attention on column “C”. What you’ll see is that on-budget revenues have been shrinking ever since Bush 43 blew up the fiscal position and those entitlement programs you think are busting the budget are actually reducing the deficit. Get your facts straight. Give Ed credit – he is giving Peaky a run for his money as the number #1 right wing loon here. Sigh!!!! Again 2slugs appears to be trying to obfuscate. Obfuscating because he cites data without links or extracting the actual data. It’s just lazy. His biggest obfuscation is using the on/off budget numbers for FY deficits even again, when he just recently admitted that the deficit was: the difference of total expenditures to total revenues. Without those links,or the data to which he references, we can not tell if/when he is comparing CY vs FY (apples to oranges), he has actually reviewed the correct column/point, and his analysis/conclusion is any where correct. CoRev You’re new to economics and you don’t have any formal training, so I probably should be more patient you. I get the sense that the OMB and NIPA tables are new to you. The OMB tables are the handiest if you want to look at deficits as a percent of GDP in terms of fiscal years. The NIPA tables do show receipts and expenditures in the Section 3 tables, but those are expressed as annualized rates and not as actual budget numbers. And not as percents of GDP…you would have to do some extra work. The usual way to do this kind of thing is to use OMB tables when looking at fiscal year budget deficits and NIPA tables if you want to look at the components of GDP. So while I appreciate that you’re a novice at this, you need to learn a little more about the subject before sounding off. Notice that you started listing the revenues as a percent of GDP beginning in FY2003; i.e., you are cherry picking the starting date. The FY2003 numbers disguise the revenue percentages before the Bush 43 tax cuts, and since the whole discussion revolved around the drop in revenues beginning with the Bush tax cuts, you are simply presenting dishonest and misleading information. I invite you to begin your search going back much further…say the Ford or Carter years. Then you should get a better sense of what tax revenues were as a percent of GDP and how that revenue stream permanently shrank under GOP administrations. The issue is not the extent to which revenues as a percent of GDP go up and down with the business cycle; the issue is that beginning with Bush 43 on-budget revenues took a permanent downward level shift. And thank you for correcting my reference to column C. You are right. I just joined AARP, so now I have AARP eyes. Column C is total receipts. I should have said column F. And I’m glad you pointed this out because it only makes my case stronger. Column C revenues include the FICA surpluses, which were very large prior to the Great Recession. Column F (on-budget) receipts show a significant drop in on-budget revenues as a percent of GDP relative to historical percentages prior to the Bush tax cuts. And that’s what we were talking about. Ed Hanson is simply wrong that the problem is increased federal spending on entitlements. In fact, Social Security is reducing the deficit. The problem is reduced revenues as a percent of GDP, and that permanent drop begins with the Bush tax cuts. Are the OMB and NIPA tables that obscure to readers of this blog that they actually need a link? Seriously? 2 slugs, no, I’m not new to economics, if you remember our past decade + of discussions, but I do admit to little formal training. Budgets deficits and budget policy has been our discussion points for those many years. Our combined federal experience in these areas is somewhat similar, with the big difference being in political affiliations. Your use of two different sources without clarifications of the differences or your attempt to remove those differences is my obfuscation point. With that point considered was the reference to Column C versus F a mistake? How is anyone supposed to know or even guess, if you start off with what MIGHT be a deception? Furthermore you now obfuscate your response by calling “cherry picking” and insisting the subject was: “…since the whole discussion revolved around the drop in revenues beginning with the Bush tax cuts,…”? No, your response was to Ed’s comment re: “It is not the revenues the government receives, but the spending it makes that causes the budget to balance or not. … Does not matter which party. And when in power, (doesn’t matter which one) that party is happy to spend in excess. Look to Congress for the problem, it is about their last Constitution authority they jealously guard.” Spending and not Bush tax cuts was the subject of your irrelevant response. Menzie what in the world are you trying to say? We are talking about Federal FY deficits and its components. Most of us understand there are differences in local, state level and federal FYs, but why are you adding more confusion? And yes, 2slufgs did a poor job in his response, whether he meant to obfuscate or not. in addition, you have little informal training as well. corev, rather than argue with people like 2slugs and menzie, who have the training and are knowledgeable, it would be best for you to sit back quietly and learn from them. you get into these wacky arguments because you are a novice arguing with experts, and they get tired of having to step back and explain how 1+1=2, when more important issues are at play which you typically are unaware exist. CoRev: Most of us familiar with economic data and budgets (for instance state FY’s typically differ from Federal) understand what is what. I am confident 2slugbaits was not trying to obfuscate by citing different timed data. There would be much more effective ways of obfuscation if one wanted to do so. Why are you not complaining when PeakTrader does this. Of course in Peaky’s case – it is just dishonest. I would very much like to look at your tables, it is a subject of interest to me. But, I need a link, I haven’t found them on my own. Evidently you do need a link. 2slugs, for heavens sake stop it! If you are going to reference a table from a site with as many links as the bea, at least point to the section you are referencing. I provided the above to show just how easy it is to do due diligence of referencing. But I’ll bet you were not looking at data this old. You clearly did something wrong. Or perhaps you don’t know how to use BEA data. Step 1: Go to the home page at http://www.bea.gov. Then go to the Interactive tab. Then click on the GDP and Personal Income tab. Go the orange box that tells you to begin using the data. Click on the arrow pointing to Domestic Product and Income for Section 1. A list of NIPA tables will show up. You can modify the date range and whether you want quarterly or annualized rates. Seriously…I thought this was kindergarten stuff for anyone who posts at this blog. This is 2slugs simple kindergarten process: Step 1 question to kindergartener : can you name this color? Step 2 Kindergartener answers yes. Step 3 kindergartener names. color. 2 slugs, seriously? Reminds me of your reasoning that seasonality should be removed from annual average temperature data. Ed, yes, federal spending is out of control. Defense spending has declined as a percentage of GDP. Yet, federal spending as a percent of GDP increased. Federal spending should be limited to 18% of GDP, except in recessions. However, it remains high at 20.5% of GDP. Entitlement spending has exploded and it’s very inefficient. Also, the massive stimulus in response to the last recession failed to raise GDP to close the output gap. See figure 1. The up blip at ’05 is GWOT spending which raised the %GDP for the pentagon a bit more than rise in non defense. ’10 up blip is recession. Pentagon %GDP is declining of late because growth is faster and GWOT excesses declining. In the pentagon tracking % GDP sent to “insecurity payments” is Hoover Institute scam to support >7% of GDP for the pentagon means the war industry is no longer a growth sector. Note that pentagon is spending same as 1969 with a lot less stuff to steam and fly. The bombing is still ineffectual ! The link is an excellent discussion. Thanks for putting it up even if PeakyBoo will refuse to read it. “Federal spending should be limited to 18% of GDP”. And yet you whine that defense spending is not 6% of GDP. Yes – PeakyBoo is even worse than Paul Ryan when it comes to fiscal policy. Hoover Inst section for selling the pentagon trough has long held that US is open to invasion and occupation if the trough gets less than 7% GDP. PeakTrader I see that you need a little schooling on how to interpret NIPA and OMB tables as well. They have different meanings. The OMB tables show the revenues and expenses of the federal government. That includes income transfers. The OMB tables are very important if you’re interested in the deficit and how much borrowing the US Treasury has to do. But the OMB tables do not tell you how much of the country’s economic resources are produced by government rather than by the private sector. How much government spends and how much government consumes of productive resources are too very different questions, and if you want to write intelligently about public finance it’s kind of important that you understand the difference. The NIPA tables tell you how much of total GDP is consumed by government resources. In other word, the NIPA tables tell you the percent of total value added activities produced in the economy that are produced by government. The economic burden is really the difference between what could have been provided by the private sector versus what was produced by the government. If the private sector could have produced $1 dollar of added economic value and the government only produced 90 cents of added value, then the economic burden is the foregone 10 cents. If the country is in a deep recession and those assets would have been idle absent the government, then the government adds or “crowds in” value. You should note that the NIPA tables tell us that the federal government only represents about 6.5 percent of value added, so it’s highly unlikely that this represents a significant economic burden in terms of foregone output. If you want to look for a more likely culprit, I suggest looking at state and local governments, which account for almost twice as much. That’s an argument for reducing the number of states from 50 to something like 10 administrative units. So in the future please try to understand the difference between what the OMB tables are telling us and what the NIPA tables are telling us. The OMB tables reflect the government’s financial position, but do not tell you anything about the economic burden in terms of foregone output. And oh BTW, the Obama stimulus was hardly “massive.” It was way too small for the magnitude of the problem. 2slugbaits, I see you didn’t understand anything I wrote. If you want to have an intelligent conversation about budgets, you need to understand when expenditures exceed outlays, you have a budget deficit. And, government can pay too much for goods, which I call waste. Moreover, transfer payments can create a disincentive to work, which is also a waste. There’s too much wasteful spending and too much spending. We need a massive reinvention of government, because the national debt is close to 90% of GDP. And, we needed a $5,000 tax cut per worker (or $700 billion for the 140 million workers at the time) and a boost in unemployment benefits, rather than numerous extensions, for a stronger recovery, rather than the wasteful and counterproductive spending. Ed and Peak Trader, it takes two to tango. It is both revenues and spending that count in creating a deficit. When you blame only one and ignore the other you are just an ideologue and are not doing economic analysis. Spencer, that’s exactly what you did. Something tells me you cannot even do a square dance let alone the tango. Both the Bush and Obama administrations tried to control the rates of outlay increases. Bush’s was post a shallow recession and Obama’s post a deep recession. Both added to the FY deficits, but Obama’s also slowed revenue growth for a longer period. Some think it was due to the type of recession, and some others think it was due to policy differences for types of incentives. Lets look at the OMB deficit tables for the years the when both houses of Congress was controlled by one party and when the Houses were split. The numbers of the deficit reported here are total and on budget, because budget is set the year before and 1st year influence is negligible, beginning the second year after power switched. I did this quick and dirty, Any mistakes should be small and not change the trends. Feel free to do it yourself, it is educational. note: the average is calculated by the count of instances in control – split 4, dem 3, rep 3. Despite the rough nature of the calculations, it is clear that reps have a the best record on deficits, followed by the splits, and the worse dems. Just seen by me I have place a note “note: surplus (total)” in the 1993 1995 line. It should be one line lower on 1995 to 2001 line. P.S. when I have the time I intend to do a more rigorous and complete work up of this approach to deficits of Congress. I will probable post it here if anyone is interested. In September 2013, it took 6.3 renminbi to buy a dollar. Same as today. In December 2016, it took nearly seven Rmb to buy that same dollar, more than a 10% difference. As for the rouble, it appreciated 20% over the last two years. Does anyone know where The Idiot gets his data? I can’t believe even Fox News analysts don’t know about how many of theirs buys one of ours vs. how many of ours buys one of theirs. Germany is spending quite less than the NATO standard of 2% like every other NATO state but US and UK. Russia is spending a little more than the US spends for the mess in Iraq, Syria and Afghan operations. Total US spending in USD is 9 or so time Russia. But I suggest Russia is not buying useless stuff like F-35, Ground Based Missile interceptors, Ford Class carriers, etc so maybe you should worry about Russia’s tiny military. China is not there! China is keeping a fairly steady rate to GDP (real money spending increases each year), but like Russia they do not spend to keep useless product lines profitable. You should worry once the OBOR is complete. Throwing bigger part of GDSP might not effect pentagon spending US in to disarmament. I go to SIPRI when I want to compare spending between nations and ues their standards to level the data. You should worry about the US empire’s royal hangers on, once the OBOR and the Russia-Iran complement are complete. Ilsm, do you have a better way to measure defense spending between countries or history? The U.S. has the best weapons technology in the world – it’s the most powerful military to defend the country, defeat evil, and deter aggression.